Hi you guys! I know I haven’t posted much lately, but I’ve had a bunch going on with my knee (not happy stuff) and then I was on vacation for a week (yay!). I feel like I’m finally crawling out from a deep deep hole. But, every little thing really is gonna be alright! And I’m gonna start blogging again. Have sure missed all of you. This card is on the Hero Arts blog today, so join me over there to find out about how I made it, and find out which of these stamps is on sale for 25% off this week! woo! I was hoping that you were not blogging because you were super busy and having fun, too…..not because of your knee! I hope it’s really better now! I have missed you and your cheerful, fun blog! I love your adorable card! It is so much fun with that Plano stamp used for the rainbow – you’re so clever! Sending you hugs! Such a bright fun card. Love how you used the Plano stamp for a rainbow. So creative. I’m sorry to hear your knee is giving you trouble. Hope things improve for you soon! Your card is gorgeous! You are rocking the rainbows! Deep deep holes are not fun. I’m also starting to crawl out of one, in my own life… I may even be gaining some momentum! I hope your journey upward continues well. this is so cute and delightful. love it, Lisa! 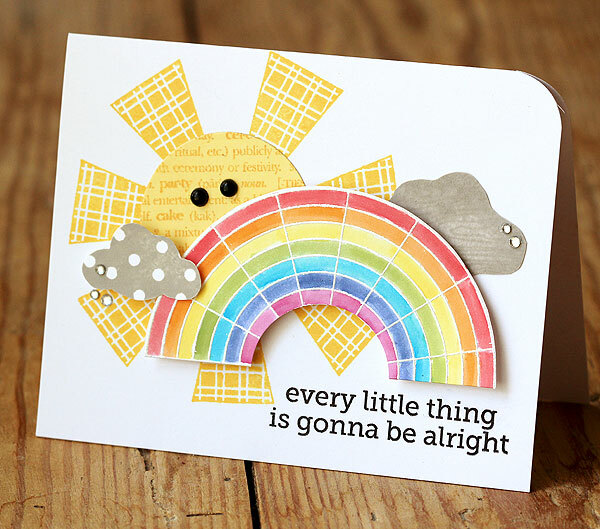 This is so fun and sets the tone for my day….Who wouldn’t love to get this card?